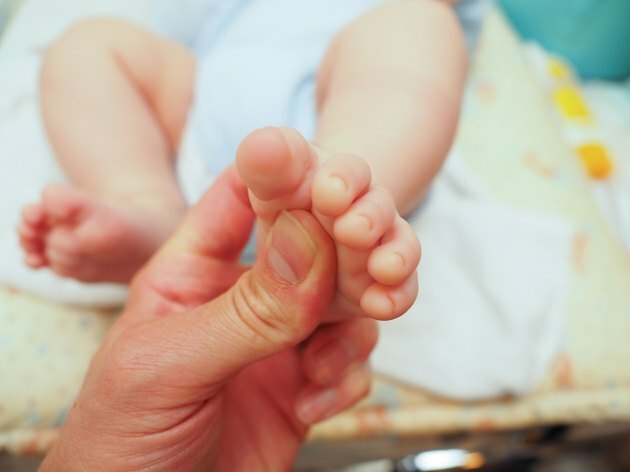 Baby toenails are very delicate and can be vulnerable to several minor but painful problems. To prevent baby toenail problems such as ingrown nails, nail fungus and brittle nails, you should keep your baby’s feet clean and dry and trim her toenails regularly. If you don’t trim your baby’s toenails on a regular basis they will tend to curl over and grow back into the skin at the top or side of the nail bed. According to the BabyCenter Medical Advisory Board, any of your child’s toes may be affected though the big toe is affected most often. Early warning signs of an ingrown toenail include inflammation, redness and obvious discomfort when your child is wearing shoes or socks. You should consult your pediatrician immediately if you think your child may have an ingrown toenail. Rough toenails, formally known as trachyonychia, is a condition in which the child’s nails lose their smoothness and transparency and become roughened and discolored. The nails may also thicken. According to the American Academy of Dermatology, the condition is usually idiopathic, which means it has no known cause, though it may sometimes be linked to skin conditions such as psoriasis or eczema. Some babies are born with a toenail problem known as congenital malalignment of the toenails. According to the American Academy of Dermatology, this condition causes the nails to grow outwards at an angle instead of growing straight. This is not a serious condition, but the nails do need regular trimming to prevent ingrown toenails. Because they are so delicate and continually growing, baby toenails need special care and attention. After you have bathed your infant, carefully dry between the toes and around the nail bed to prevent formation of fungus. If you child has dry or cracked skin on or around her toes you should apply baby lotion. Trimming the toenails regularly will prevent ingrown nails. According to Baby Weekly, your baby’s toenails grow slightly slower than his finger nails. This means that they will only need to be trimmed once or twice each month. The best way to trim them is to use baby nail clippers or baby nail scissors. Do not cut the nails too short and don't leave any sharp edges; otherwise he may scratch himself.